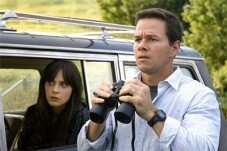 How god-awful does M. Night Shyamalan’s thriller The Happening get? Marky Mark Walhberg actually talks to a house plant. I wish I was making this up. Now I realize Shyamalan’s intention for the scene and the film in whole — mankind has pushed Mother Nature too far and the planet uses mind manipulation to destroy its human inhabitants. A near-glib premise that holds enough weight to make a decent Twilight Zone episode circa 1950s, maybe even a successful M. Night Shyamalan feature. It could have worked had Shyamalan made wiser choices that don’t fall with a clunk like the one where Walhberg talks to a house plant. The greatest failure on Shyamalan’s part is that he has stopped respecting the audience’s intelligence. Everything is spelled out in such agonizing exposition. Even the character’s motives are clumsily explained: “I don’t like to show my feelings too!” The talking points by key characters and news anchors going on about the environment’s biting cause have the subtlety of a running drill against the skull. It is very aggravating to watch a movie that has exchanged much needed ambiguity, menace, atmosphere and compelling characterizations for said exposition — even more so from a filmmaker who has proved himself a smart and skillful one more than once. The premise is a compelling one: people, for some airy reason, are subject to possession and committing suicide. Scenes of the mass population being driven to inventivelykill themselves are disturbing for the tact strategy that goes into their execution. The blood letting is sparing, and kept to a minimum to maintain its effectiveness without going into overkill. Construction workers fall from a high rise with balletic grace before making sickening thuds. Much ado has been made about this being Shyamalan’s first R-rated feature, though anyone expecting to witness a holocaust will be attending a small-scale spectacle of human annihilation. One scene sorely in need of inclusion takes place in a souped-up cineplex theater bursting with inconsiderate, loud-mouthed, cellphone-blaring teenagers like the ones I was watching The Happening with. This would be followed by them going into a trance and start simultaneously choking to death on their blueberries, laser pens and stinky nachos. That would have been appreciated. There is anger simmering in Shyamalan’s vision; a billboard advertisement reads “You deserve this!”, however he is not angry enough. Some deaths just don’t have enough impact; through his aloof camera lens (though it’s supposed to be Elliot’s point-of-view, and ours by proxy), we see one man calmly lie down in front of an approaching giant lawnmower. For Shyamalan’s ‘message’ to work, it would be better had the whole group lined up for the human thresher. There are many more opportunities throughout the film that could have been more dire and immediate. Unfortunately, the film’s no-pulled-punches approach fizzles away along with the suspense. The story as well as its characters lack the urgency and drive to escape a phenomenon that is also recognized as unknown: what exactly are these people running from? Landscape shots of overcast trees bending by the wind, to my dismay, just don’t inspire dread. Immediacy is key for a plot deprived suspense thriller. Our heroes seem to be in a daze themselves; the dialogue is very labored. Desperate to survive, Julian, a high school teacher played by John Leguizamo (Summer of Sam, 1999) at one point takes his sweet time saying goodbye to his friends also on the run, leaving his daughter Jess (Ashlyn Sanchez) in their care, in order to hitch a ride back to save his wife. The driver, being his ride, waits very patiently to the point of parody as Julian yammers on and on about his situation until you just want to run him over with a thresher yourself. No plot? We should be so lucky if that were the case here. It’s worse due to being episodic and contrived. For heroes, we’re stuck with a high school science teacher Elliot (Mark Wahlberg — “It says Dirk Diggler!”) and his shaken wife Alma (Zooey Deschanel, All the Real Girls, 2003) whose marriage is ebbing. These characters are so bland that I fear Shyamalan has confused the everyman to be synonymous with triteness. Wahlberg’s hero comes across as befuddled and disengaged much of the time, as when he crash landed in Tim Burton’s Planet of the Apes (2001). It is with a heavy heart that I recognize that Deschanel, one of our generation’s loveliest and most gifted actresses, has delivered an awkward and unappealing performance. This alone should sentence Shyamalan to 500 hours of community service for his shoddy direction. Deschanel’s mesmerizing gray-blue saucer eyes (“One day, you’ll be cool.”) are exploited so ceaselessly here to dredge up Steven Spielberg’s patented wide-eyed-awe moments. Usually an apocalyptic scenario can make the private lives of the characters seem so trivial. It is unfortunate when the character’s lives actually are trivial. Alma’s greatest sin was that she had dessert with a male co-worker and lied to her husband about it. Whoa! It is always best for filmmakers to ask themselves if the major disaster was taken out of the story, would the character’s personal subplots make a compelling movie on their own? It is a question I wish more blockbuster filmmakers asked themselves. I would like to single out one out of several dozens flawed moments in this film: Our heroes have taken refuge with Mrs. Jones, the reliable stock crazy old woman who lives on a farm, played by Betty Buckley (the doomed gym teacher from Carrie, 1976). Over dinner, Elliot and Alma witness Mrs. Jones violently smacking Jess’ hand as she innocently reaches for a cookie. Shyamalan gives the Mrs. Jones, Elliot and Alma suitable close-up reaction shots. Everyone except Jess, the one who got hit. That is downright incompetent filmmaking. A dramatic moment is lost where Jess could have looked up to her guardians in hurt bewilderment, silently begging them to say something. The adults, conflicted by their need to appease Mrs. Jones for shelter, should have been shamed for doing nothing. The Alma character is so clueless about her dire situation that it becomes downright insulting. She makes a desperate, however romantic gesture very late in the film that is needless and isn’t earned; considering that their sheltering holds out some hope. Worse still, she jeopardizes the life of Jess, a little girl in her care, as though the whole venture for survival was meaningless. This is where Shyamalan’s attempt at emotional manipulation is most flawed and transparent. Director Frank Darabont was more successful with a similar scenario last year with The Mist (2007), while even having the nerve to end on an inescapable and devastating note. Shyamalan has painted himself in a corner with this premise. The appropriate conclusion should be grim and uncompromised. Technically, everybody should have died, but the final moments come across as a cop out. Just like James Wong’s Final Destination followed by the atrocious David R. Ellis sequel, but that’s an essay for another day. There is no excuse for M. Night Shyamalan to miss the mark so many times here. After all, some of his previous features prove that he is a natural filmmaker. One of his more admirable qualities is that his films are quiet and introspective. His best work gives substantive weight to material usually regulated to the B-Movie gallows. Admittedly, I have not seen his previous two features The Village (2004) and Lady in the Water (2006) so it was quite a shock to see how far gone Shyamalan has gotten. I thoroughly appreciated his thoughtfully chilly The Sixth Sense (1999). Unbreakable (2000) is high up on my Top Ten Superhero-Movies List. 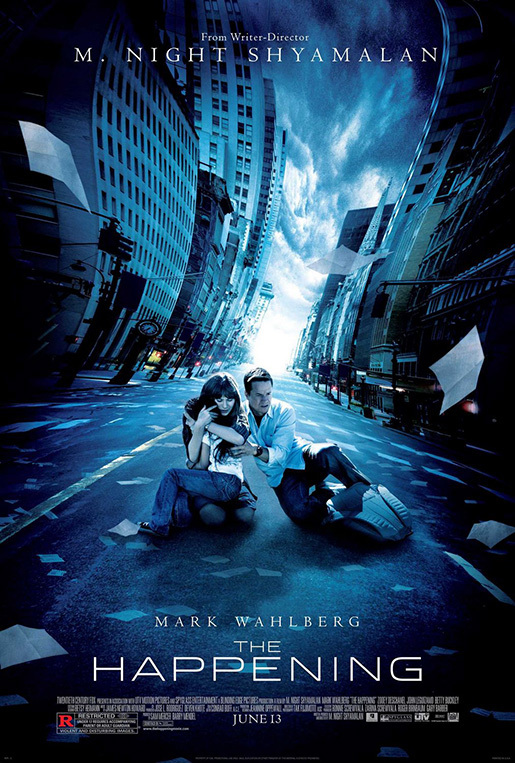 Signs (2002), his most successful feature, is the closest to form The Happening is trying to emulate. Comparing the two, The Happening pales considerably. Even the comic relief of the Mel Gibson character (“Paddy wagon!”) works while a similar kind for the Walhberg character (“I’m still talking to it”) does not. Especially familiar but lacking is the main title sequence against the superior one of Signs. This title sequence is a small masterpiece in of itself. I am dumbfounded that the James Newton Howard score here isn’t as heralded with such giants as Bernard Herrmann’s Psycho and John William’s Jaws. It is one of the most distinct and memorable scores that has stayed with me. There are a couple compelling moments spread out thinly in The Happening. One effective sight involving ladders, rope, and trees is marred by a loud sting sound effect Shyamalan uses cheaply instead of letting the visual get under the skin. I wasn’t bothered by the lack of plot, but by the lack of atmosphere and thoughtfulness usually associated with Shyamalan’s work. Uninspired characters jeopardize a film that dwindles toward an equally uninspired climax. As is, the only person who could dig this movie is Poison Ivy from Joel Schumacher’s Batman and Robin (1997 — awful, awful movie). I hope Shyamalan is humbled and returns true to form next time. USA (MPAA): Rated R for violent and disturbing images.